Some people think that $150 is too much to spend for a hotel room. So if you're one of those people, please hit the Back button in your browser, save us both a bunch of grief. I got a truly luxurious present for my parents, who are notoriously hard to buy for, especially my father, who doesn't hide his feelings about presents. I don't think, until this weekend, I had ever given him a present that he really liked. And it was surprising to me that he liked this one, because it wasn't exactly an intentional present. Sound weird? Keep reading. Last June, when I moved into my then-new digs in suburban Boston, for some reason I got a yen for a big flat-panel TV, a Sony 42-inch baby. So I went to a local electronic store and went shopping. I thought about buying a smaller one, or less expensive brand, and couldn't make up my mind, so I went home. On my way, I turned around, plopped down $8,000 and bought the television of my dreams. It was great living with this TV for a year. Now I'm going mobile again, so I needed a place to park the TV and some other things, so I moved it to my parents' house, never thinking that my Dad, who watches no TV, would be intrigued by it. He was. I turns out there was a reason he doesn't watch TV, he can't hear the tiny crappy TV they had until Friday. Along with the crisp 42-inch digital picture, the Sony also has very beautiful sound. He can hear it. And it made him happy. And considering that it's his 75th birthday and Father's Day, it made me happy to finally be able to give him a present that truly delighted him. It doesn't get better than that. Really. 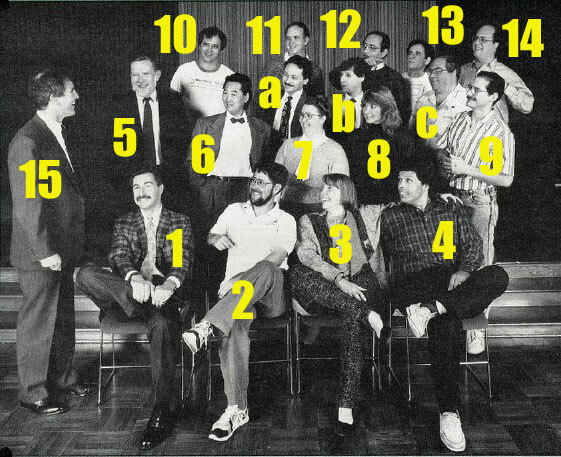 Above is a picture of fourteen Macintosh software developers grinning at an Apple executive. It appeared on the cover of the 1989 Computerware software catalog. Look at those smiling faces! Choose me, choose me, they seem to be saying. I can make nicest meal. I make great baby. I clean house perfectly. I sell mucho hardware! So for 10 points each, what are the names of each of the Chinese house wives? Use the comments section to show how historical you are. And here's the original picture, without the numbers.